"The ability to sit down and write a song is something that I think is a great gift that has been given to me." It is a truth universally held that a great singer deserves a great band; and after struggle, strife and hardship the perfect storm has wrought the perfect band. 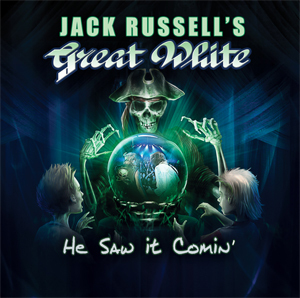 Jack Russell is that singer, and with the solidification of a lineup that includes guitarist Robby Lochner, guitarist/keyboardist Tony Montana, bassist Dan McNay and drummer Dicki Fliszar, you have the musical vehicle that is JACK RUSSELL'S GREAT WHITE. While the band has been touring and working on new music for the past five years, there have been a lot of line-up changes and even a few instrument switches that have led up to the well oil machine that fans now witness onstage. The countless hours of work that have gone into the band’s debut album, He Saw It Comin’, courtesy of Frontiers Music, were well worth the wait. Russell and album producer and guitarist Lochner have what can only be termed a collaboration of souls; a melding of music theory, ideas and heart. The new album was recorded in Lochner’s home studio and while the digital age has made it possible for many bands to have members that live apart from each other, the two wanted to work face to face. They followed traditional recording methods and bounced ideas off each other and the rest of the band for the duration of the recording process. Another interesting change in the band dynamic has been the transition of Montana from bass to guitar; The creator of the memorable "Mista Bone" bass-line has always actually been a guitarist. As a young player he taught lessons in California and when he was initially brought into the GREAT WHITE fold in the 1980’s the need was for a bassist and the multi-talented artist switched to four strings to give the band what was needed. 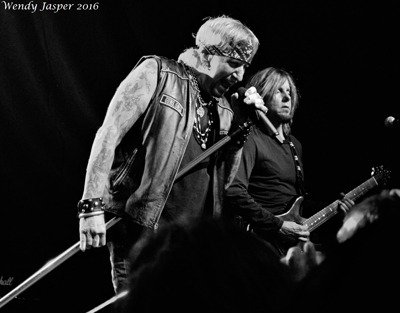 Times have changed and when given the opportunity, Montana eased into the role of guitarist and keyboardist for this new iteration of JRGW. The long awaited album has also been a hot topic for Russell and his cohorts. The first video, “Sign Of The Times” has already been viewed nearly 50,000 times in just the few short days since it’s been out. There were several singles leaked leading up to the January 27th release. The CD release party at the Whiskey in Los Angeles on February 3rd is slated to be the party of the season with special appearances by Lita Ford, Don Dokken, The Claude Von Trotha Band, and other rockers of the same era and genre. Another nice surprise for fans is that the album will be available on vinyl! Russell and company have put together a beautiful layout with photograpy by Jaymz Floyd Eberly and a complete lyric listing. There will be tour dates coming up across the country this year and Russell encourages fans to get out and see the band. “If you haven’t been able to see us, this would be the time,” he said. “We will be consistently scheduling shows and we are going to try to hit as many markets as we can this year. We want to get out and see as many people as we can.” For those that have not heard the new record, Russell says there is something for every rock fan on the album and hopes that it continues to appeal to old and new fans alike. The video for “Sign Of The Times” can be seen on KNAC.COM right HERE.